10121 Cave Creek Road is located in the highly desirable Forest Village Patio Homes. This was a great home that sold in a little over a month. Call The Hollinden Team today and see how they can sell your home. Residents tell us that the location is the key to the desirability of these garden homes. Point #1 is that most people are not aware of these homes just off of Hurstbourne PKWY as they are tucked in the trees. The second point goes towards the proximity of these garden homes to shopping, doctors, entertainment, etc. It is a couple of miles to the Shelbyville Road Corridor. The other direction would take you to the Westport Road area. This patio home offers a nice open floor plan perfect for entertaining. As you enter the front door, you can see all the way to the rear and trees outside the wall of windows in the sun room. The kitchen is modern with Stainless Steel appliances and even features a warming drawer. And, yes, the kitchen does have a gas range. 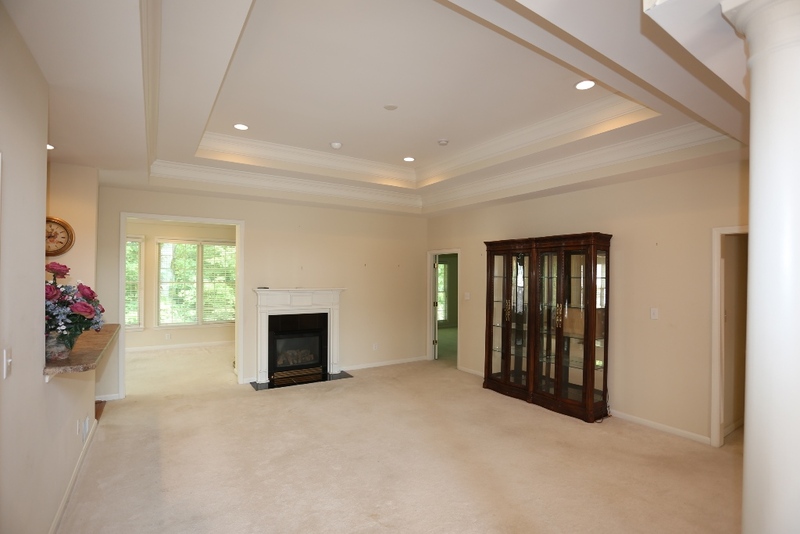 The kitchen is open to the dining area and also open to the vaulted great room. The master suite is at the rear and also features a tree-line view. We also have a nice office at the front of the unit. This patio home is a little unusual as it has an upstairs bedroom suite complete with walk in closet. This would work well for your guests or that young person that is still living with you. There is another bedroom that is the same size as the master located in the walk out basement. Full windows here make this a relaxing room. The finished walkout basement is also set up for entertaining as it features a wet bar and another gas fireplace. The patio off the rear is enclosed with windows and screens. It also has three electric heaters to extend the time that you can enjoy this area. This room lets you really get back to nature as the trees and wildlife are very close to your personal enclave. This home is priced $35,000 less than its next door neighbor due to the need for some TLC. A fresh coat of paint and some new carpet or hardwood would make an immense change. This garden home is available for immediate possession. To see if 10121 Cave Creek Rd, MLS#1391131, is the patio home you’ve been looking for in Eastern Jefferson County, give Steve Dobbs a call today at 502-475-3312 to schedule your private tour. The Hollinden Team can also help you with other Forest Village Patio Homes For Sale in the area.